In 16th-century northern Europe, during a time of increasing religious and political conflict, Flemish painter Pieter Bruegel redefined how people perceived human nature. Bruegel turned his critical eye to mankind’s labours and pleasures, its foibles and rituals of daily life. Portraying landscapes, peasant life and biblical scenes in startling detail, Bruegel questioned how well we really know ourselves and also how we know, or visually read, others. His work often represented mankind’s ignorance and insignificance, emphasizing the futility of ambition and the absurdity of pride, and he would became one of the most significant artists of the Renaissance period. 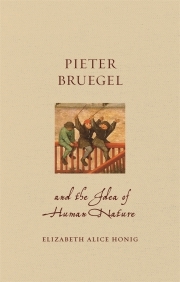 This superbly illustrated volume examines how Bruegel’s art and ideas enabled people to ponder what it meant to be human. Published to coincide with the 450th anniversary of Bruegel’s death, it will appeal to all those interested in art and philosophy, the Renaissance and the painting of the Dutch Golden Age. Elizabeth Alice Honig is Professor of European Art History at the University of California, Berkeley. She is the author of Jan Brueghel and the Senses of Scale, Painting and the Market in Early Modern Antwerp (2016).